May 4th while outside looking at the different kinds of bees that were visiting the white clover in my backyard, I happened upon a cloverleaf with a cluster of bug eggs. I brought the leaf inside the house because I intended to record the hatching with my scanner. It has been a while since I've made a bug movie and I have been indirectly looking for bug eggs since last year. Two days later, the eggs hatched while I was very busy cooking dinner, but I managed to scan the eggs approximately every 45 seconds. Dinner was a little late. Since then I have been trying to identify the bugs. At this time, I believe the bugs are spined soldier bugs: Insecta: Hemiptera: Pentatomidae, scientific name: Podisus maculiventris. I came to that conclusion based on the eggs. 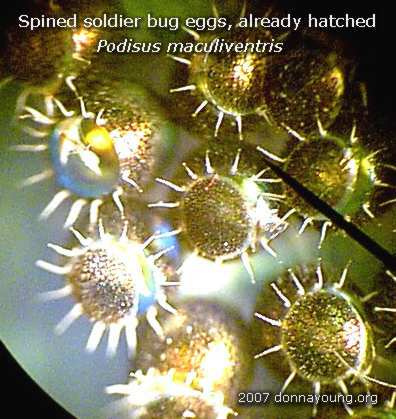 Just today I learned that the bug eggs that I have fit the description of spined soldier bug eggs. 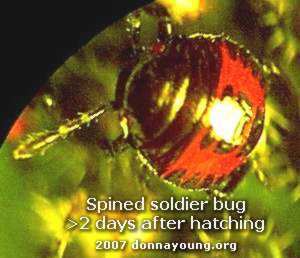 From what I have read about spined soldier bugs, they are predatory. They prey on caterpillars and leaf beetle larvae. Around 40 hours later, I put the bugs under the microscope and I took a few pictures [how to do that: Digital Images & Microscopes]. It was challenging to get a decent picture of the bug because they walk very fast. After taking a few pictures, I let the bugs go outside near the place where I found the eggs. 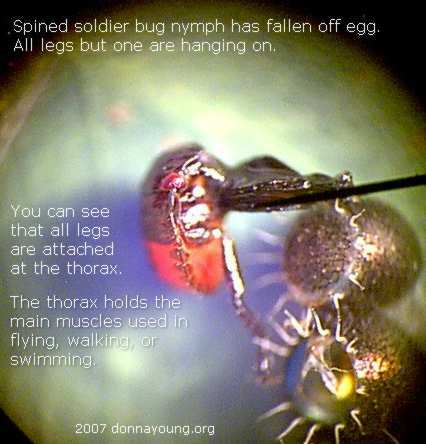 I am almost tired of researching bugs. Just yesterday, I used the microscope to look at some bugs that were on an oak leaf. Several clear caterpillars were eating the leaf and I could see two of the caterpillar's systems in operation under the microscope. An insect's heart is the rear part of a full-length vessel. I could see the vessel in the clear caterpillar and its pulsating heart. I could also see its digestive system. I took pictures, but I doubt that I will post them. That has nothing to do with the main topic of my post.